We ship both domestically and internationally. You can see if we service your part of the world by viewing your cart contents and selecting the estimate shipping option. You will have a drop down option to select your country. For international shipments we will only ship to the billing address of your credit card. This is done for our protection as well as yours. As the importer you will be responsible for all duties and taxes that your country imposes. Please do not confuse this for additional shipping charges. These are collected at time of delivery by your country's customs representative. Please do not ask us to mark your package as a gift or to lower the declaired value. We will not do this under any circumstances. It is illegal and punishable by fines and or jail time. Do to the high volume of fraud and theft, all packages sent to China, India, Ukraine, South Africa, and Russia is at the risk of the purchaser. We cannot be held liable for packages lost or stolen as these packages cannot be tracked. We strive to ship all packages within 1-2 business days. 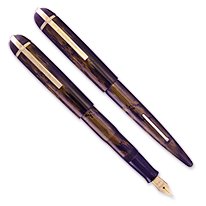 Custom orders such as specialty nibs can add to that time based on how busy we are. If you have special shipping requirements please contact us before you place your order. Our normal shipping days are Monday, Wednesday, and Friday.